Hey @muppeth & other support staff! Is there any chance that nextcloud can be updated to 6.0.5? 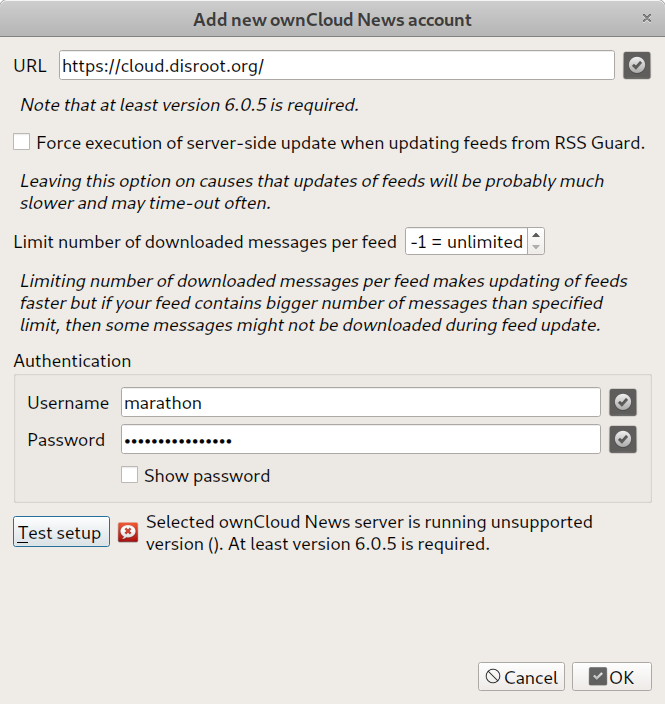 My RSS client (RSSGuard) won't fetch the feeds unless version 6.0.5 at a minimum is used. Thats funny. Current version of nextcloud is 15.0.2 and news app is 13.0.3 and we are running those. Not sure what RSSGuard is looking at but might be that owncloud versioning (the project nextcloud was forked/derived from) is different hence the issue? Ah well, I took a look on their github page and the project is looking for a main developer. So, it seems, it's dead in the water and little chance of someone adding the needed hooks. I'll try another client. Currently News app on nextcloud is also looking for maintainer so the future of the service in itself is also quite a question mark. We want to help out looking for developers in near future also donate some money in that direction to lure some devs, however if all fails we will have to look for alternative, standalone rss viewer. just use ones browser? So, next I'm trying QuiteRSS which I have used briefly in the past. Apparently it supports Nextcloud. Thanks @muppeth! however if all fails we will have to look for alternative, standalone rss viewer. needed hooks. I'll try another client. @muppeth What is the connection syntax to connect manually to Disroot's Nextcloud newsfeed? login credentials and am getting 'connection refused'? No sorry I was just not in front of laptop to answer. The point is it wont work. Pointing your app to Nextcloud RSS will not work as it needs to utilize api's to get the data out of it. Link to the news app is https://cloud.disroot.org/apps/news but thats not going to work. What, you're not always connected?! OK No worries @muppeth — Newsboat is what I'll stick with, as it just works without any fuss. Sheesh, I'm sorry, my bad! I shouldn't forget the time zones and the fact you're in Europe, making you ahead of us timewise, in the Americas. Best of Luck with your work project! No worries, its my choice to be active at that time and I do it with pleasure.